Turmeric! It’s anti-inflammatory, anti-cancer, and about ten other things. Basically, the answer for everything. (OK, maybe we can’t go that far…) It’s gone mainstream, too. I just saw “Golden Milk Powder” samples featured on display at a local store. But the product had dextrose and other weird ingredients in it and it was pricier, so I’ll continue to make my own. Mine is higher quality, even if it is a little more time-consuming. This recipe is not the one you stir together in the evening, in some “relaxing” ritual. (I don’t have time for that myself!) No, this is a quick, handy version, to get optimal nourishment in minimal time. Perfect for a fast breakfast, for those of us who need to stay healthy while keeping up with a tight, rigorous routine. Every morning, I whirl up a hot drink for husband Tom and I in the blender. I use a scant 1-oz. 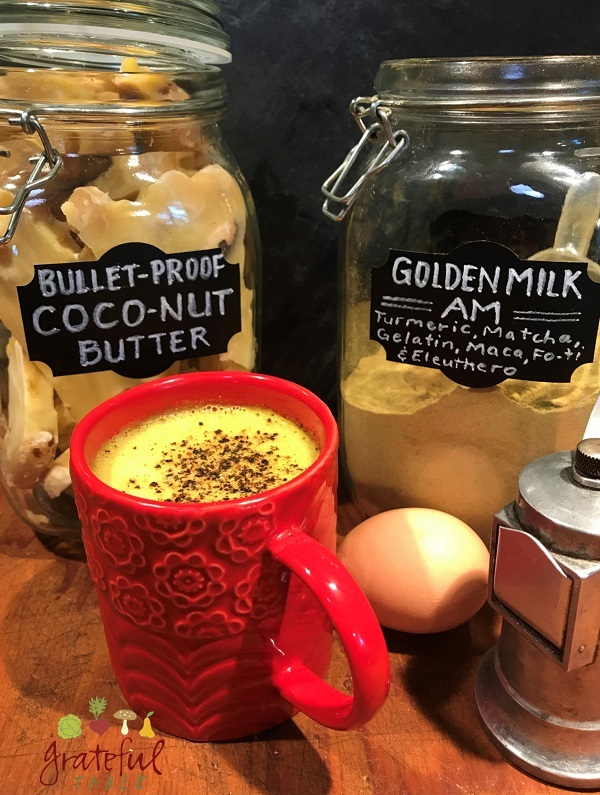 scoop of this Golden Milk AM blend, plus about 2 TBS. “bullet-proof coco-nut milk” (or coconut cream or oil), for two drinks. I fresh-grate some black pepper on top, since it works synergistically with the turmeric. Oh, I also add a raw egg (yes, I sometimes feel like Rocky Balboa). But it’s delicious! You can leave some of these items out. Or you could do like me and invest in these bulk herbs. After researching their benefits, I invested, and have been glad I did! This particular recipe yields almost a quart of concentrated blend, and will make about 40 drinks. Per serving: raw egg, optional! Grate fresh black pepper on top and serve.